Antigen A B of blood cells. Our Abpromise guarantee covers the use of ab24223 in the following tested applications. ICC/IF: Use at an assay dependent dilution (PMID 19608744). 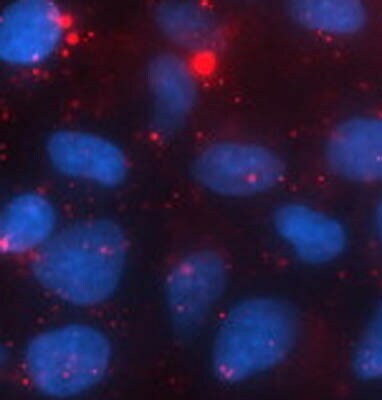 ab24223 staining Blood Group AB antigen in A549 cells by Immunocytochemistry/ Immunofluorescence. Cells were rinsed in PBS and fixed in 4% paraformaldehyde in PBS (15 minutes), rinsed, and blocked in 5% lamb serum in PBS/Tween 20 (15 minutes, room temperature). Cells were rinsed three times in PBS before application of primary antibodies. ab24223 diluted 1/400 in 5% lamb serum in PBS and applied to the fixed cells overnight (4 °C). Specimens were rinsed three times in PBS, and Alexa 568-conjugated goat anti-mouse IgG secondary antibody diluted 1/800 in PBS was applied. Counterstained with DAPI. Publishing research using ab24223? Please let us know so that we can cite the reference in this datasheet. There are currently no Customer reviews or Questions for ab24223.